Trieste, December 20, 2016 – Ship construction contracts valued at approximately 2 billion euros between Fincantieri and Virgin Voyages (part of Virgin Group of companies) for three new cruise ships have been finalized and are now effective. The three units will be built at the shipyard in Sestri Ponente (Genoa) with delivery scheduled for 2020, 2021 and 2022 respectively. Each ship will weigh about 110,000 gross tons, be 278 meters long and 38 wide. 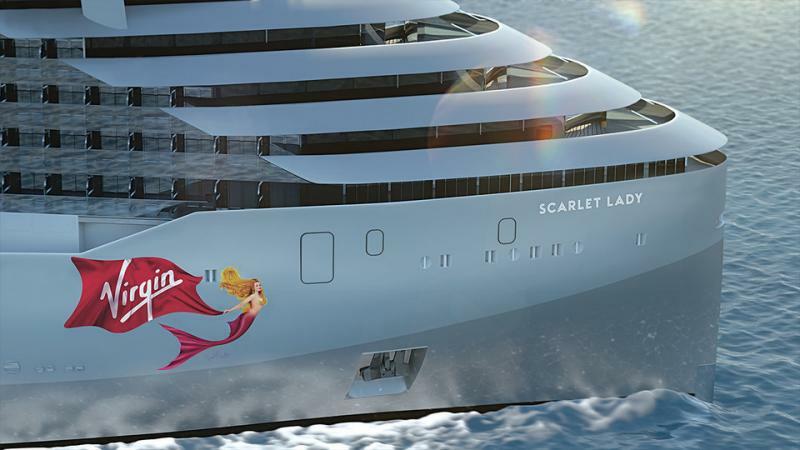 The ships will feature over 1,400 guest cabins that can host more than 2,800 passengers, accompanied by 1,100 crew members on board to deliver the famed Virgin service. These ships will stand out for original design and craftsmanship. They will include some highly innovative ideas and design solutions, notably for energy recovery, reducing the overall environmental impact. For example, they will be equipped with an energy production system of approximately 1 MW, which uses the diesel engine’s waste heat. The result is, therefore, a project which distinguishes Virgin Voyages in the worldwide cruise scenery. Trieste, 22 March 2017 – The steel cutting ceremony of the first of three new cruise ships that Fincantieri is building for Virgin Voyages (part of Virgin Group of companies) was held today in Sestri Ponente (Genoa). The ceremony was attended, among others, by Tom McAlpin, President and CEO of Virgin Voyages, and for Fincantieri by Luigi Matarazzo, Senior Vice President New Building Merchant Ships, and Paolo Capobianco, Director of the Sestri shipyard. Each ship will weigh about 110,000 gross tons, be 278 meters long and 38 wide, with delivery scheduled for 2020, 2021 and 2022 respectively. The ships will feature over 1,400 guest cabins that can host more than 2,700 passengers, accompanied by 1,150 crew members on board to deliver the famed Virgin service. 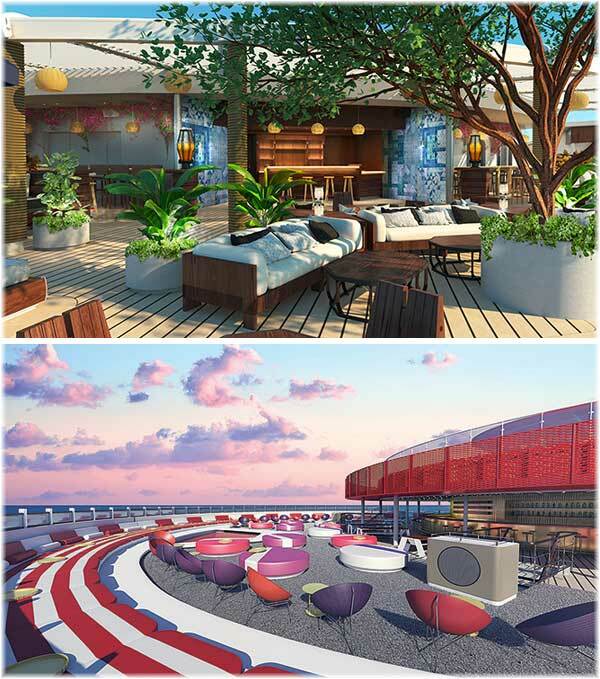 Virgin Voyages is promising to reinvent the cruise experience, and one of the most traditional parts of a cruise ship – the funnel – will be rethought and redesigned for the company’s upcoming trio of Lady-class ships. “We’re at the top of the game in super yacht design,” said Kristian Arens, exterior design lead for England-based Redman Whiteley Dixon (RWD). 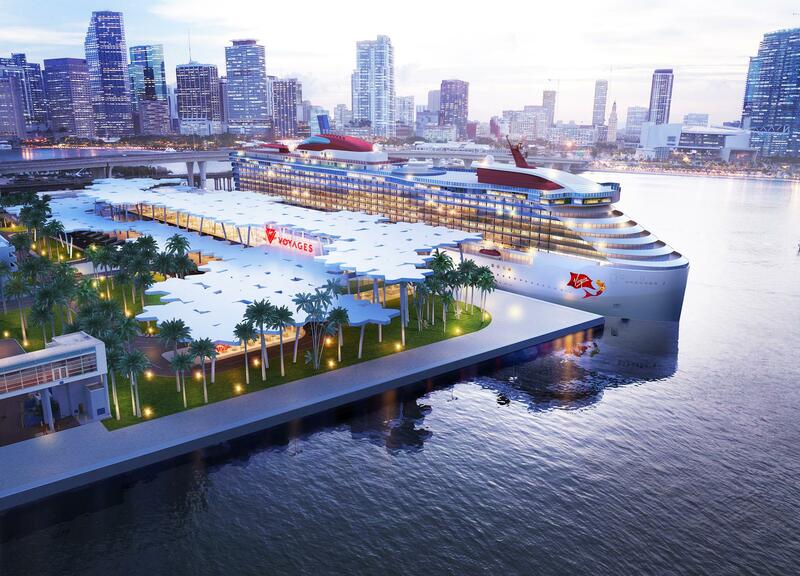 The design firm has been tapped by Virgin to redevelop the cruise ship funnel. “This big cruise ship needed elements to be more of a super yacht than a cruise ship,” continued Arens. Added Adrian Chisnell, project manager: “It was actually known as the non funnel … traditionally (the funnel) has been a bit of an afterthought. It has been put on top of the boat. “This is the first time we know the funnel is not being used in that way,” he said. The duo from RWD described their design brief for Virgin as luxurious and iconic, while being different, exciting and new. “The Virgin Voyages ship will hopefully be one of the most recognizable in the world,” Chisnell said. Virgin Voyages has revealed further details of its new cruise line and the three new 110,000-ton cruise ships, the first of which is currently under construction by Fincantieri. 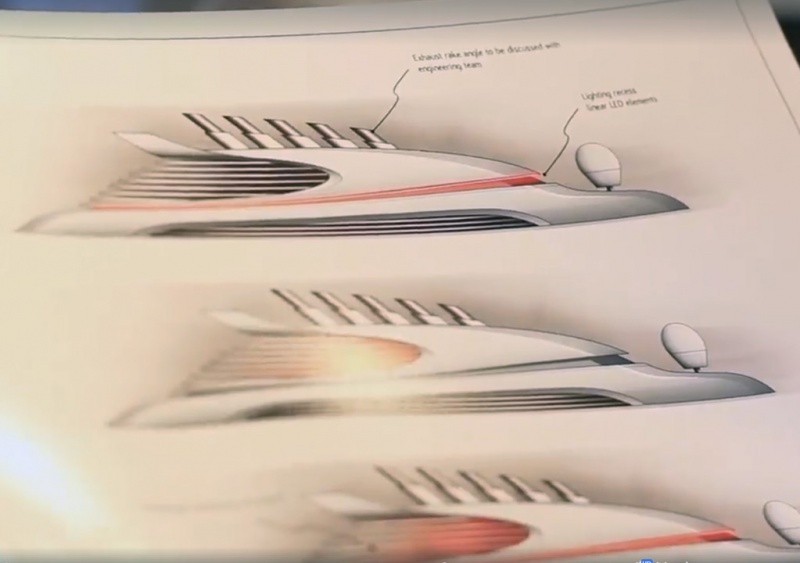 At a New York City event, Virgin provided a first look into some of the interior designs for the new ship. 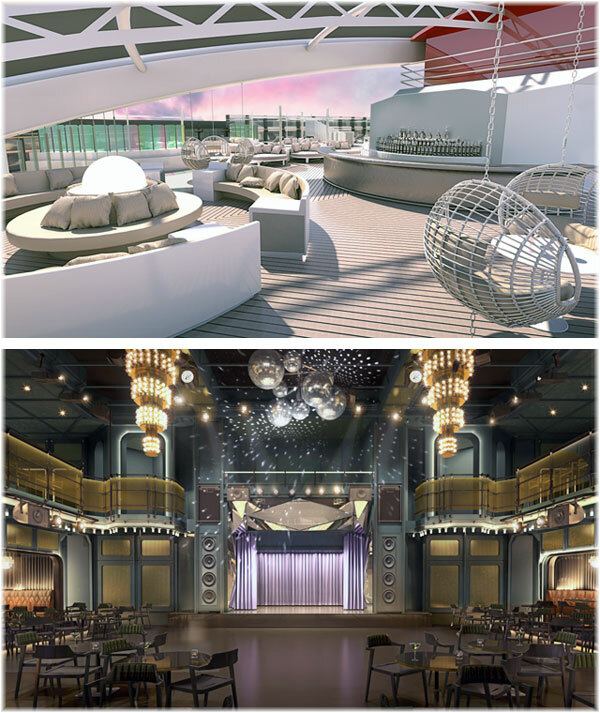 Tom McAlpin, President and ceo of Virgin Voyages, stated that they are committed to creating “more than just another cruise line.” While the ship will accommodate more than 2,700 passengers, they are seeking to create “a more personal and intimate experience,” he notes. McAlpin says they spent a full year on design and another year on engineering. Steel cutting for the first ship began in March 2017, with elements being built at three shipyards, including Romania and Palermo The Fincantieri yard at Sestri Ponente in Genoa started assembly on October 31, 2017. Using what Virgin is calling a “Creative Collective,” they brought together leading interior design firms, none of whom had any experience of cruise ships to develop the passenger spaces. The idea is to bring a new perspective, as part of Virgin’s mission to redefine what consumers can expect from a holiday at sea. Everything is proceeding under the watchful eye of Virgin founder Richard Branson. While he is not involved in the day-to-day of the process, sources familiar with the progress say that Branson is copied in and reviewing at key junctures. The effort is very sensitive to being faithful to the Virgin brand and for example when it comes to the shipboard nightclub, which was inspired by Richard Branson’s history in the music industry. “If Virgin can’t do the best darn night club at sea, nobody can,” they say. Fincantieri and Virgin Voyages celebrated the steel cutting today for the second of three Virgin ships being built at the Sestri Ponente (Genoa) Shipyard. During the event, Virgin Group Founder Sir Richard Branson and Virgin Voyages President and CEO Tom McAlpin, welcomed by Giampiero Massolo and Giuseppe Bono, Chairman and CEO of Fincantieri, also revealed the name of the first ship currently under construction at the yard: Scarlet Lady, inspired by the name of one of the first aircrafts to fly for the sister company Virgin Atlantic. According to a prepared Virgin statement: “Scarlet is the embodiment of everything this ship represents, As our figurehead, she takes on a role historically dedicated to goddesses, important women in society, and even mermaid figures. 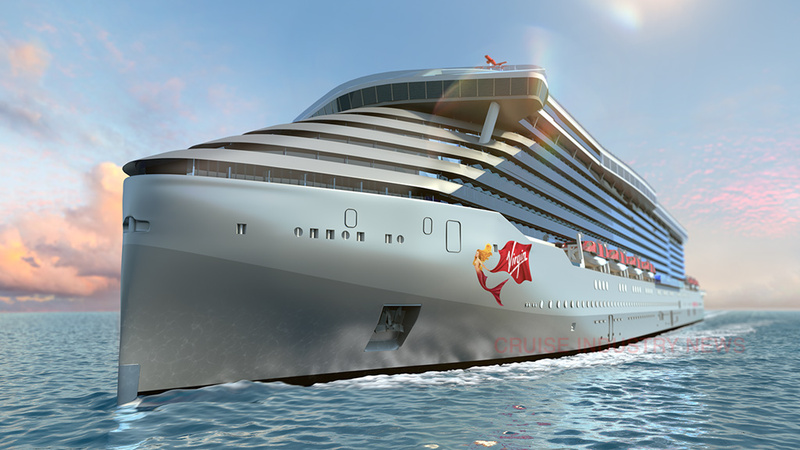 Virgin’s second ship, as its sister ships, will be about 110,000 tons, be 278 meters long and 38 wide, with delivery scheduled in 2021, while the Scarlet Lady will set sail in 2020 and the third in 2022. They will feature over 1,400 guest cabins that can accommodate more than 2,700 passenger, plus 1,150 crew members. 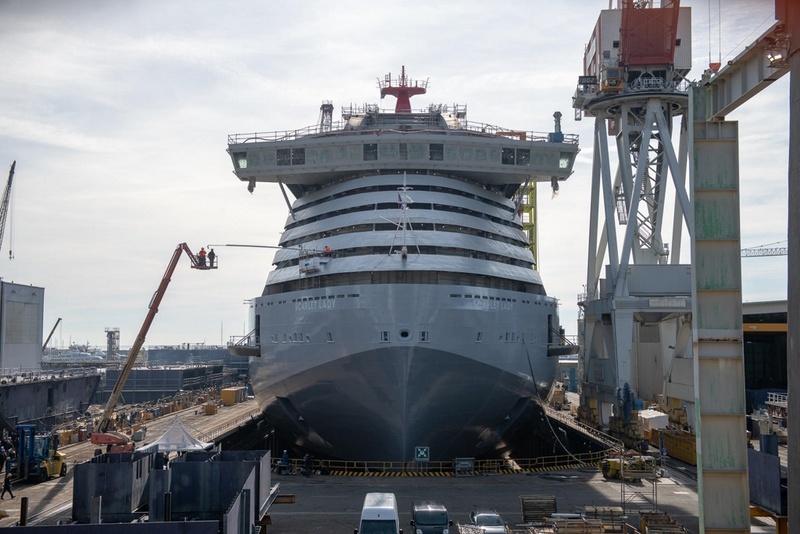 Trieste, February 8, 2019 – “Scarlet Lady”, the first of four ships which Virgin Voyages (a brand part of Virgin Group) ordered to Fincantieri, was floated out today at the shipyard in Genoa Sestri Ponente. Interior fittings will now begin, leading the ship to its delivery, scheduled at the beginning of 2020.